Celtic manager Ronny Deila refuses to put a price on Leigh Griffiths' head after the Scotland striker scored his 50th and 51st goals for the club. Griffiths hit the net either side of half-time as Celtic beat Dundee United 4-1 at Tannadice to move six points clear at the top of the Premiership. In recent years, the club have cashed in on the likes of Virgil van Dijk, Gary Hooper and Victor Wanyama, but Deila says Griffiths is going no-where. 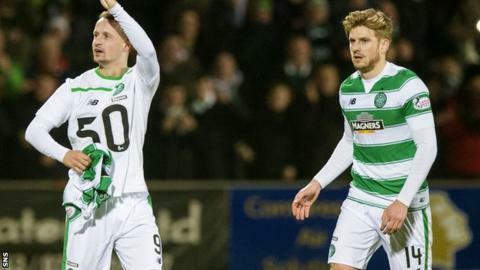 "He's vital for us," said Deila. "He works so hard and is an unbelievable finisher. He's also creating space for the others, for Tom Rogic and for Kris Commons and Stuart Armstrong." Griffiths got Celtic underway with the opener when he took advantage of a slip by United defender Gavin Gunning before Jozo Simunovic headed in a second. Simon Murray briefly got the hosts back in the game, but after Griffiths scored a third, Kris Commons volleyed in a sublime fourth. "To score four goals away is always difficult," Deila told BBC Scotland. "We could have scored more but lost the ball too much. "There was so much space and they really wanted to go forward. "Confidence is very important. Winning games gives you confidence so we should be confident. We saw a lot of good play today." Dundee United manager Mixu Paatelainen saw some positives from his side and urged them to build on that ahead of a crucial home meeting with Kilmarnock next weekend. Already 11 points adrift at the bottom of the Premiership, United cannot afford to slip further behind. "I thought the attitude was excellent and we did create a couple of openings," said the Finn. "Celtic defended well, but on a couple of occasions we got behind them and worried them, but I felt we gave the ball away far too easy. "We should have been more patient on the ball. We were too anxious. "Next week is a massive game. That's what I told the players in the dressing-room. "We put our sights now on next weekend, make sure that everybody is ready and give Kilmarnock a good game. "They'll come here and be direct and be very dangerous, they've got plenty of power up front and it won't be easy. "But, if we are patient, we take our positions right and we take care with our passes, we can worry them."